UA shows excellence through advancing technological developments. 1. Full-fledged R&D department. Innovation is the key for future success, and with our powerful R&D capabilities we develop innovative solutions for your markets of today and tomorrow. 2. Ingenious Mold Techniques. High quality packaging is only a given when it comes from an advanced mold. UA has foremost become a renowned manufacturer because of its mold techniques. 1. We introduce unique solutions to the public frequently; we’re also up to the task to develop advanced custom solutions for you. 2. Our R&D can be considered the best of the best, and it shows in the results. Whether you need to produce faster, to produce cheaper or something else we come up with the best solution for your goal. 3. We pay attention to the smallest of details like making a corner as sharp as possible, or a footprint as stable as possible. 4. The R&D team works daily on all factors of production to achieve a higher efficiency. In order to develop more business, we look to produce faster and to allow more production opportunities in the same time. 5. One of the techniques we apply is ensuring the use of the right cooling process for a mold. With a better cooling technique the production time for certain components can be reduced in half compared to a standard mold. 1. Our expertise on tooling new molds made the difference that has led us to become one of the key cosmetic packaging companies in China. 2. Aside from representing a high quality, our superior molds eliminate high maintenance, and save on delivery times and long term costs. 3. We continuously invest in newer and better mold technology and machinery. Why? This is the source where the quality of a product is defined, where it matters the most. 4. Our packaging has better advantages for the most competitive markets in the world. 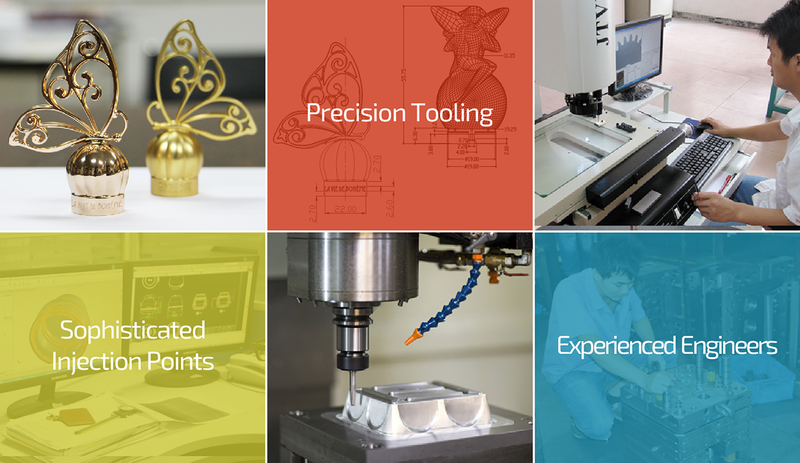 We built our molds to last, offering long term quality and cost saving perspectives. 5. We carefully calculate data on material, shapes and features of a package which enables the tooling of more efficient molds. We add value to the tooling process, by increasing innovation and achieving a reduction in unit costs.